The emperor, Nerva was born Marcus Cocceius to a family distantly related to Tiberius. He became a successful and respected lawyer with strong political ties. He had a favorable relationship with Nero, and received honors from him. He subsequently shared two consulships, one with Vespasian and the second with Domitian. 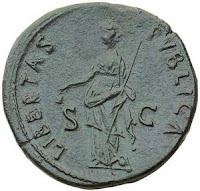 Nerva's political alliances, especially senatorial ones, no doubt led to his inclusion in conspiracies which brought about Domitian's assassination. On the day of Domitian's death, Nerva was promptly proclaimed emperor through the power of the senate. 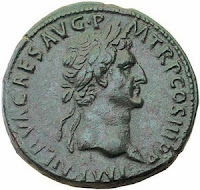 Nerva did not have a strong military background, unlike previous emperors, so he never held favor of the armies, most of whom had strong alliances to his Flavian predecessors. Nerva sought the favor of the military with limited success. One manner which he employed to do so was through the propaganda power of coinage. 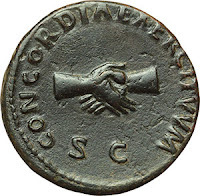 Many types were issued in different metals using the devise Concordia Exercituum --Concord of the Armies. Knowing he had limited backing from the armies, he sought increased power by courting public favor. He set on a campaign of improvements in infrastructure and restructuring taxation in favor of the populace. He spent so much money on building projects that the senate created a commission to oversee spending on public works. Nerva also used coinage to convey to the populace the benefits of living under his regime. Nerva sought reform, but at the same time continued the policy of internal spying and persecution employed done during Domitian's reign. This focused on his political enemies, especially those holding key military positions. Many of the people holding such power did not like the manner of their treatment by Nerva, nor did they like the way he sought to circumvent the need for their support. Numerous uprisings occurred. 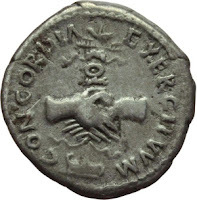 Nerva sought to placate the armies financially, as was common practice to buy loyalty, but this met with little success. Seeing dissent and his own lack of managerial control, Nerva sought to name an heir who would not only be popular, but also a competent ruler. 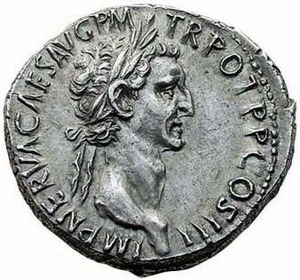 He adopted the governor of Upper Germany, Marcus Ulpius Trajanus, as his heir, and gave him extensive power while Nerva was still on the throne. Four months later, Nerva died and Trajan succeeded him. The wisdom of Nerva's choice of Trajan set a precedent for the manor in which Rome's next four rulers would be chosen. 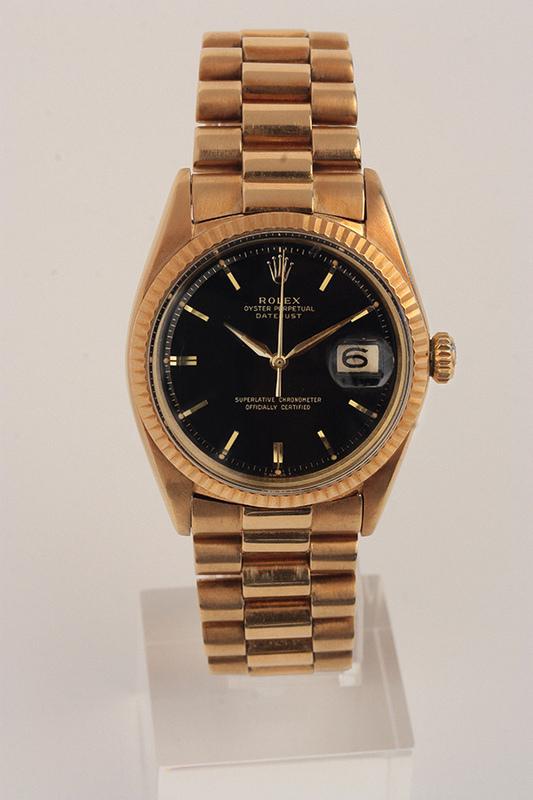 Artemide Aste is glad to announce the next Vintage Watch Auction, to be held on 11 June 2015, starting at 15:00 (San Marino Time, CEST). The catalogue, complete of high resolution pictures of the wataches, is online and open for bidding. It will be possible to bid live during the auction using the DeaMoneta website, at no additional cost. Artemide Aste è lieta di annunciarvi la data della prossima asta di orologi da collezione: Giovedì 11 Giugno 2015 alle ore 15:00. L'asta sarà battuta presso la sede di Artemide Aste al WTC pal. B 7° piano, via Consiglio dei Sessanta n. 99 , Dogana - Repubblica di San Marino. L'asta inizierà alle ore 15:00, i lotti saranno visionabili dalla mattina alle ore 11:00 e nei giorni precedenti previo appuntamento. Il catalogo d'asta, con le foto HD degli orologi, è on line e è già aperto per fare le vostre offerte. Il giorno dell'asta, per chi non potrà partecipare di persona, sarà possibile partecipare in diretta sia per telefono che tramite internet, utilizzando la tecnologia Live Auction offerta da DeaMoneta. Per informazioni o chiarimenti su questa possibilità, potete contattare Artemide Aste che vi fornirà tutti i dettagli tecnici.